Soundproof Window Treatments are not replacement windows. Your current windows remain in place. Our windows go in front of your existing windows so there’s no need for the inconvenience of major renovations. Easily installed, the entire job can be done in about 40 minutes each with no mess. Where does the noise enter? Most people think that noise enters the home through the walls but that’s simply not true. About 90 percent of the external noise entering the home comes in through windows and doors. Soundproof Window Treatments block outside noise from entering your home, making for a nice, quiet, peaceful environment. 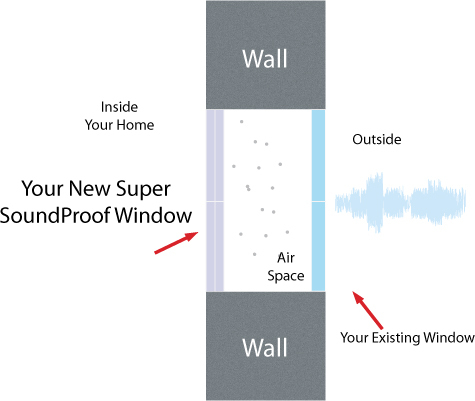 When external noise impacts your windows, they create vibrates that amplify the sound. Soundproof Window Treatments eliminate up to 95% of that noise. In addition to reducing noise, Soundproof Window Treatments provide an additional layer of insulation for windows, eliminating drafts during the cold season and reducing cooling costs during the hot summer months. They actually save 30-50 percent of your monthly heating and cooling bills. Our Soundproof Windows also decrease the intake of dust, pollen and other allergens, making your home more comfortable as well as quieter.